Day One SES New York and SEMPO have kindly put on an open bar; it’s tucked in between the SES Awards/Speaker Event and the Pub Crawl. I had a nice glass of white wine when I walked in. In no time at all I dropped my business card into a bucket waved at me by a SEMPO employee (part time) – it’s a chance to win something (money off at Starbucks, I think) and, of course, for SEMPO to find out whether they could recruit me into their organisation. I wasn’t alone. I was with – let’s name no names – one or more UK agencies. The SEMPO rep asked why we weren’t already part of SEMPO UK. It was interesting to see that myself and ‘one or more’ UK agencies both listed the same reason why we’re not in SEMPO UK. In particular we don’t agree with some of the business practises carried out by ‘significants’ in SEMPO UK. For me I strongly detest those agencies who consider keywords to be their own IP and who will not share them with their clients – this, right now, is common in SEMPO UK. This wasn’t just my opinion as ‘one or more’ agencies with me agreed. SEMPO started to hold the presentation. They begin by congratulating the current officers and point out that Gord Hotchkiss has stepped down. I’ve not met Gord but he’s one of my favourite bloggers. He’s smart. It’s a loss to SEMPO not to have him. Chris Boggs speaks for SEMPO and he’s a good speaker. He begins by addressing whether SEMPO is too American focused. He denies it. He gives reasons why SEMPO has some US specific interests. Minutes later he’s making embarrassed jokes as to why his SEMPO re-cap is... you guessed it, American focused. I’ve taken a picture of the presentations used but I couldn’t but help notice there is _no_ SEMPO UK. There’ a SEMPO Eastern Europe, though. There’s a ‘working group’ in SEMPO for the UK. Amazingly there’s nothing for Germany. The whole thing reminded me of my SEMPO review I did last year where I noted that SEMPO had made some progress but SMA had struggled. 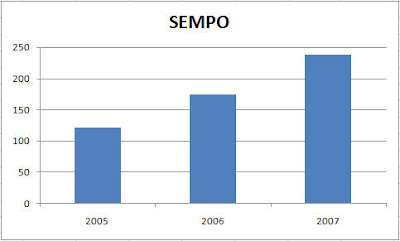 Let’s continue that research into Press Releases and see how well SEMPO has done in pushing the word in 2007. The following graph looks at mentions of the word ‘SEMPO’ in Google News over different years. So it does look like SEMPO had a better year this year (although, really, Google News added more sources likely to mention SEMPO which is why the count went up). Finally, it's worth noting that one of my favourite Agency Gossip rags Agency Spy poked fun at the recent iCrossing/SEMPO press release today. I suspect we’ll see changes at SEMPO UK this year and continue to see conflict SEMPO over the next few years. Thanks for the post. Although I have stepped down as Chair, I'm still a director, so SEMPO's not rid of me that easily. As far as SEMPO UK, there is a working group and it's picking up in strength. Our regional representation is as strong as the local people involved in the organization. Sometime ago I was also critical of SEMPO (back in the early early days) and was countered point blank by Barb Coll who said, "you want to change things..get involved!" I did and I've never regreted it. I know I've made the same comment to a few of the local board members. If you ever want to chat about SEMPO, I'd be happy to spend some time with you. Andrew, I off course know to what you refer, but you are off the mark re SEMPO. The working group has 16 regular contributors and is not influenced by any lone voice. The membership is building rapidly with a mix of agencies, specialists, corporations, students and more. It is a diverse and eclectic mix and your voice would be welcome. I personally have an issue with a number of SEMPO members globally actively involved in what I would call link spam, but I want to change things and help the industry mature - hence I buy the raffle tickets. I have been reading through your blog with interest and it was unfortunate that both of us were at the same event and didn't manage to clock each other. This was only down to me missing your presentations, but as you know it was so much to do so little time to do it all. I had a very interesting conversation with Chris Bloggs of SEMPO and outline the Ecommerce Excellence University program we are launching in Scotland in April. We have a vested interest from RBS and the Scottish Executive plus Glasgow City Council are also keen to have a role in the program. Chris said SEMPO could also be interested and for the bigger launch we talked about having a SEMPO event in Scotland. I would be very keen to pull together the UK SEMPO group to put it firmly on the map and discuss the Ecommerce Excellence program in more detail. I am of course in the orocess of becoming a SEMPO UK member. I'm in complete agreement with you with the prior direction of SEMPO UK. Thought leadership is widely sought after in this country, but seldom of any real value - SEMPO UK is no exception. I agree with what Gord is saying as well, though. I think there's room to change and be receptive to the needs of the industry in the UK. After talking to some of the folks after the SEMPO state of the market report, I joined, and it wasn't just because of the caffeine addiction I picked up. :) We will see changes this year (as you point out), and I want to be a part of affecting change here in the UK and in Europe. I realise I'm on the other side of the SEM fence to you as well, but the quality of contributions and leadership of both sides doubtless needs addressing, and quickly. Great blog, by the way. Definitely added to the faves.